Sometime ago, those of us who entered political movements for change walked on our first picket line or marched in our first demonstration. At some point we got hooked on concepts like “Freedom”, “Direct Action” and “Resistance” to get rid of Jim Crow racism. Eventually we came to learn how to spend time in jail, survive police and vigilante violence; to organize poor and working class black people; to extract perks and building blocks from federal programs and build coalitions among unpredictable community groups; to fight city hall; to negotiate agreements that produced opportunities and skill development for community development; and to manage campaigns to elect black politicians. But then one day we looked around and realized that many of our friends (and enemies) who made that journey, or similar journeys, were no longer with us….to laugh with, relive old conquests, or just tell lies. Too many have moved to places unknown, gotten sick, or passed on to the next life. So many of our collective stories go untold. These stories must be told, and hence the evolution of this project entitled, The North: Civil Rights and Beyond in Urban America. 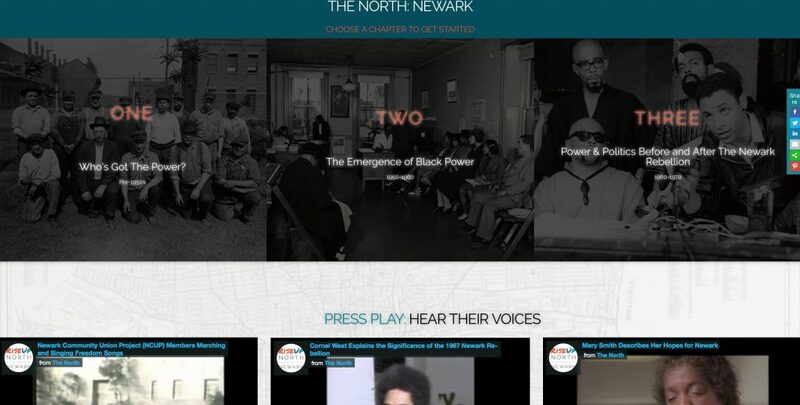 Visit the project’s website Rise Up Newark to hear and read stories about the growing empowerment of black people and other communities in New Jersey’s largest city. Photograph slideshows tell more. I’d love it if you also leave a comment on Facebook or on this blog to let me know how you like this resource.